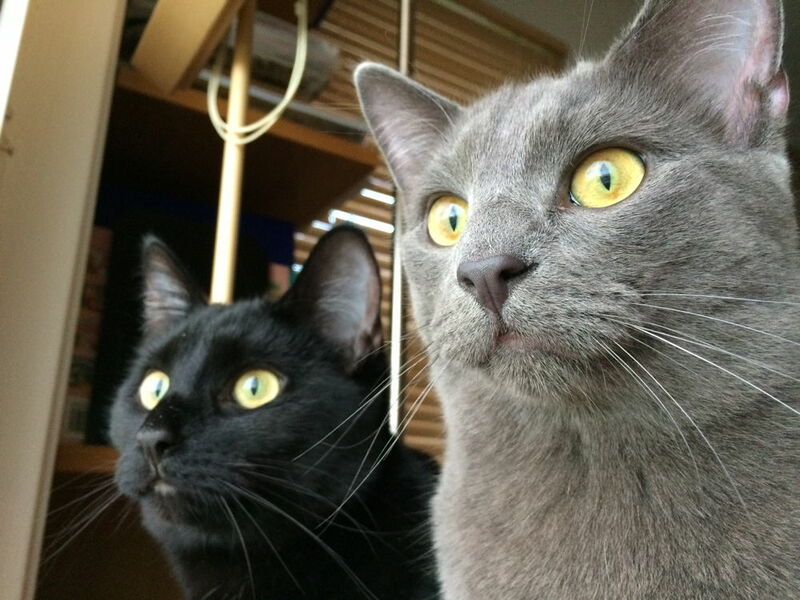 Today is the first birthday of our dear kittens, Franny and Pepper. Adorable as they may be, we feel that it is appropriate to give a fuller picture of their characters by telling the story of one of their most heinous crimes — and its effect on all the creatures in our household. Pearlio, our sweet betta fish, joined our family almost three years ago when we adopted him from our neighbor, Val, who was headed off to New Zealand as a missionary. (It’s not practical to take a betta fish on an airplane to New Zealand, no matter how cute it is.) 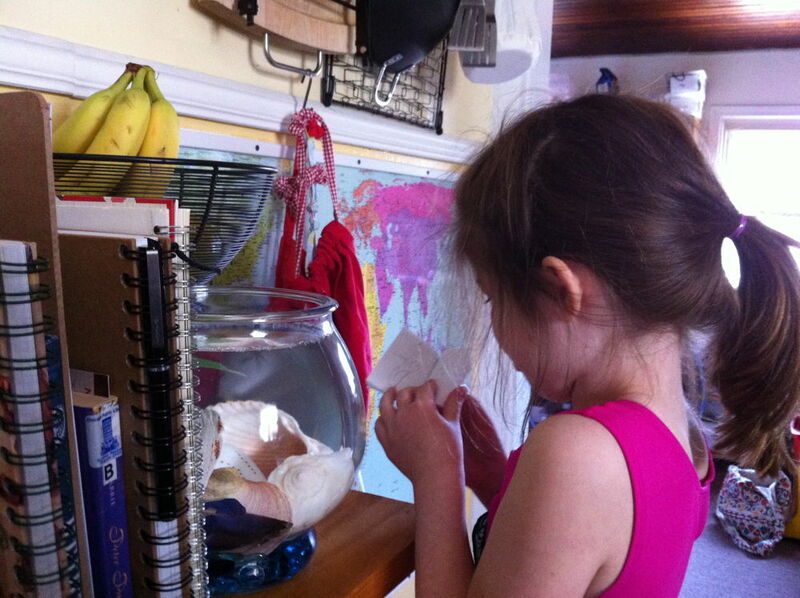 We figured that Rosie had finally grown out of her uncontrollable urge to plunge her hands into the fishbowl (she was a very curious two-year-old), so we happily adopted the fish. A girl and her fish. The girls immediately declared the fish to be a girl (“It’s so pretty!) and named it Pearla. We customized the bowl with some of our favorite shells saved from a trip to Florida several years before. A few weeks later, we learned that the colorful bettas are, in fact, male — and so his named quickly became a masculinized “Pearlio.” Our Italian fish. Frankly, last summer I had been wondering when Pearlio was going to kick the bucket. He had lived in our house for two years, but he was not a baby fish when we adopted him. 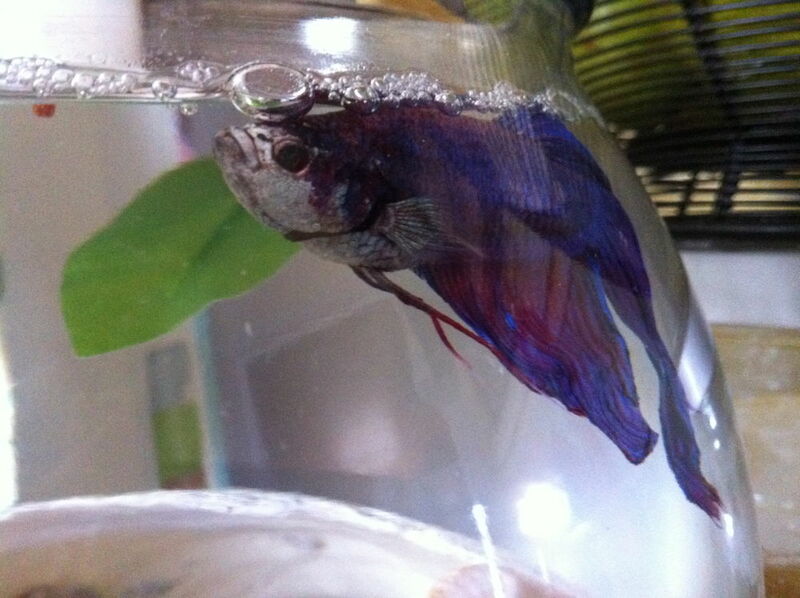 In a burst of morbid foresight, I took some photos of him swimming around his bowl. It’s hard to capture his likeness through the fishbowl, but there you have it. Rosie sometimes liked to read stories to Pearlio. 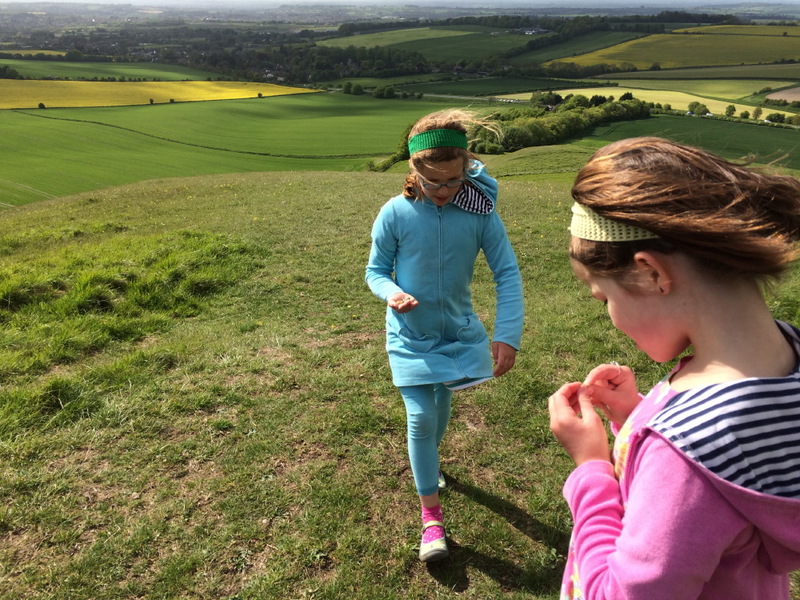 At the end of September 2014, our whole family left town for a long weekend — Jon to a conference in California, the girls and I to Madison, Wisconsin for a combination work-and-wedding trip. This was the first time we had left our new cats on their own, and I planned very carefully. The girls and I de-cluttered floor and shelves so that the kitties would not be tempted to eat the Barbie shoes. We moved several houseplants to the basement. Our excellent neighbors came by twice each day to feed them, freshen their litter, and to see if they had destroyed anything in our house. A week or two before our trip, we had seen the cats “playing” with Pearlio. 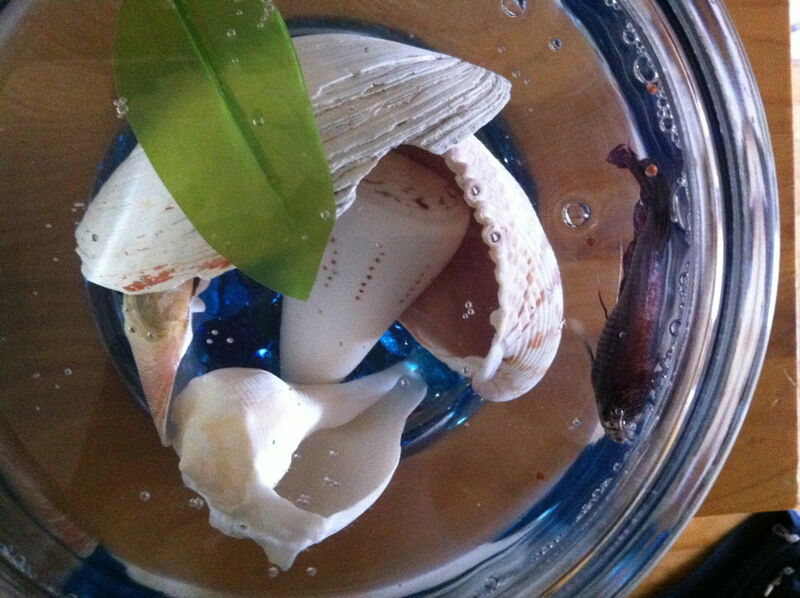 (One might also call it “hunting.”) At this time, our fish was located on an easy-to-reach countertop. We moved his bowl to the top of a high, cluttered bookcase where the cats seemed to forget about him. On the third day of our trip, my cat-sitting friend sent me a text: “I have bad news for the girls. I’m afraid the cats finally got Pearlio.” As we pieced together the scenario, it seems that the cats — undistracted by young children dressing them up in hats and carrying them around in baskets — finally had the time and inclination to plot their crime. They had jumped up onto the top of the bookcase, deftly knocked several items off on the way to their goal…and went fishing. But I grieved my underestimation of the cats’ cunning strategies. I wished that I had put Pearlio in our bedroom with the door closed, or in the basement, or somewhere more inaccessible. I was shocked by the violence of his death — in our own home, too! Mostly, I regretted that we had not sufficiently protected this little, helpless creature in our care. It has taken me a little while to forgive our cats for following their wild-animal instincts, but Jesus is helping me. After our return home, we held a memorial service for Pearlio. I think I needed the closure more than the children. Our cat-sitting friends joined us for a five-minute service, after which the children played on the jungle gym and ate gingerbread cookies and mandarin oranges. Having done some research now on “fish funerals,” I came up with my own, very simple version which I’m including here — just in case you ever have a need to perform an ichthyic funeral in your own home. Rest in peace, Pearlio. You were a good fish. Pearlio — one chill dude. 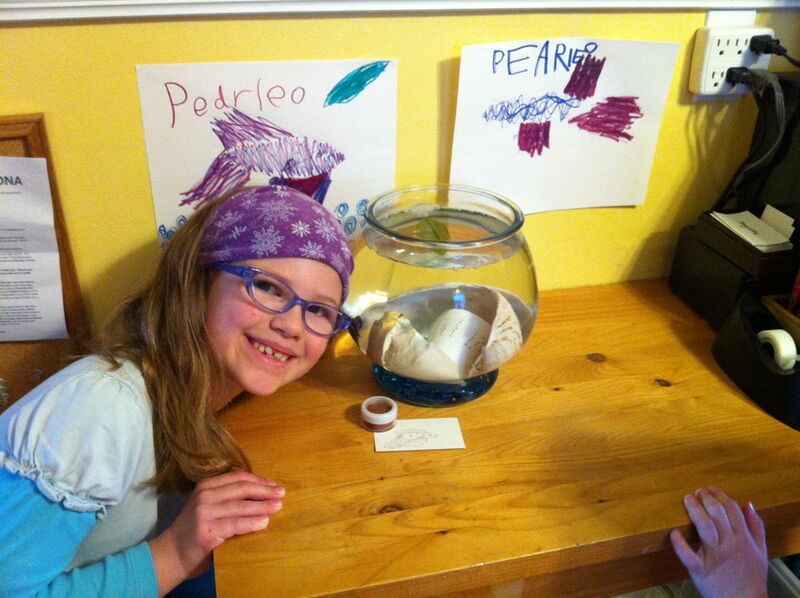 Pearlio was a good fish, and he lived an extraordinarily long life for a betta — over two years. Once the pet of Val Smith, we adopted him and loved him — even though we initially thought he was a girl and we named him Pearla. Pearlio liked to eat, vigorously chewing just a few bites at a time. He slept, protected by his shells, and we like to think he greeted us when he swam over to see us. We will miss him. Here, friends and family place pebbles from Pearlio’s bowl into the hole we dug in the ground. Dear Jesus, we know that you created all things in this world, including Pearlio. Thank you for letting us share some time with him. Comfort us in our grief, and we trust you with Pearlio’s future. We love you. Amen. Absolutely fabulous story and perfectly worded. You have quite a flare for the written word. Love it!